Custom embroidered Mid Profile Structured Constructed caps are caps that have a bit of structure to them. They offer buckram behind the front panel for a firming crown. They still offer a very trendy style and are not at all like the old fashioned styles our grandpa used to wear. We have selected a few here that are top notch and the selection of colors are great. Combine all styles for embroidered discounts! Another fantastic promotional type cap. 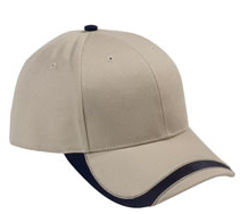 Great price custom embroidered BX020 Big Accessories 6-Panel Structured Twill Cap. 100% cotton twill; 6-panel, structured; low-profile; front panel constructed with buckram; matching Velcro® closure. Custom embroidered logo included. Port & Company® - 6-Panel Twill Structured Cap. CP80. Another fantastic promotional type cap. 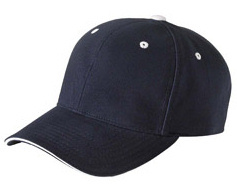 Great price custom embroidered Port & Company® - 6-Panel Twill Structured Cap. CP80. Velcro closure, fine quality. Fabric: 100% cotton twill, Structure: Structured, Profile: Mid, Panels: 6, velcro. Custom embroidered logo included. Custom embroidered Port Authority ® - Easy Care Cap. C608. The ultimate uniforming cap featuring all the easy care qualities you love about our Easy Care Shirts (S608) and Silk TouchT Sport Shirts (K500). 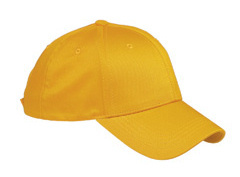 This cap coordinates with the shirts, and is available in the top 11 uniforming colors. 65/35 poly cotton, structured, mid profile, Self-fabric adjustable slide closure with brushed nickel buckle and grommet. Custom embroidery on front included. Custom embroidered Port & Company ® - Sandwich Bill Cap. CP85. 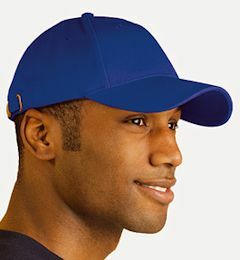 A tremendous value, this cap complements your logo with its contrast sandwich bill. Custom embroidery on front included. 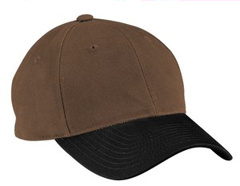 100% cotton twill, structured, mid profile, velcro closure. Custom embroidered 136 Anvil 6-Panel Brushed Twill Cap. 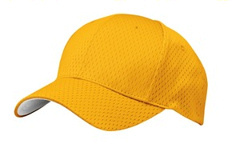 100% brushed cotton twill; 6-panel, structured; front panel fused with buckram backing; precurved bill has six-row stitching; sweatband with four-needle topstitching; sewn eyelets; adjustable tuck-away self-fabric strap . Custom embroidery included. Sharp looking custom embroidered OSTM Big Accessories Old School Baseball Cap with Technical Mesh . 100% brushed cotton; 6-panel, structured; polyester technical mesh in contrasting color; twill closure with buckle and tuck-in grommet. Custom embroidered logo on front included. Custom embroidered Port Authority ® - Two-Tone Brushed Twill Cap. C815. 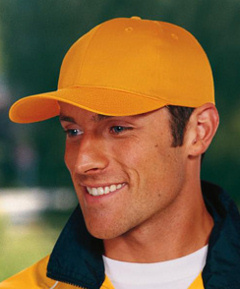 A rare combo of a low profile and a structured fit make this handsome two-tone cap a winner. Custom embroidery on front included. 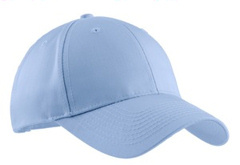 100% cotton twill, structured, low profile, velcro closure. Custom embroidered Port Authority ® - Pro Mesh Cap. C833. Breathable and comfortable, this cap has a great pro look, complete with a contrasting grey underbill. 100% polyester, structured crown. Velcro. Mid profile. Custom embroidery included. Sharp looking custom embroidered BIG accessories SWTB Big Accessories Sport Wave Structured Baseball Cap. 100% cotton chino twill baseball cap with waved bill insert in contrasting color mesh. Contrasting color top button. Self-fabric, two-piece Velcro® closure. Custom embroidered logo on front included. 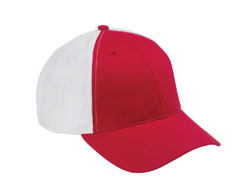 Custom embroidered 6262S Yupoong Yupoong Brushed Cotton Twill 6-Panel Mid-Profile Sandwich Cap . 100% brushed cotton twill; 6-panel, structured, mid-profile; eight-row stitching on bill; matching underbill with 3 1/2" crown; medium buckram backed front panels; contrasting sandwich bill, sewn eyelets and top button; self-fabric matching adjustable Velcro® closure Custom embroidery included on front at no extra charge.